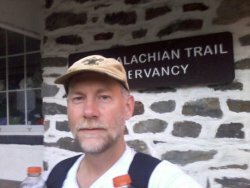 I hiked the Appalachian Trail from August 13 to August 17, 2014 from Harper's Ferry, WV north to Duncannon, PA. The plan was to hike half the trail, ending on Mt. Katahdin in Maine around October 5th, but a problem with my knee started on the second day. After four days of hiking in pain, I visited a doctor in Duncannon. She said I should slow down and walk on level terrain, but I could keep hiking the trail and take pain medications if I wanted. After four days, and looking forward to a week or more of the same, and not having time to take 3 or 4 days off, I chose to end my hike until next year. This page is a nutshell of my very short adventure. Starting with my daily blog entries, I've added a few pictures, details, and things I learned on the trail. On my long hikes, I'm promoting the Boy Scouts' ScoutStrong Program to encourage youth and adults to be consistently active through their lifes. I also promote the concept of making your own gear and lightening your pack load without sacrificing comfort, saety, or efficiency. From here on, you can read about my five days on the trail. Tomorrow starts this year's long hike for me. 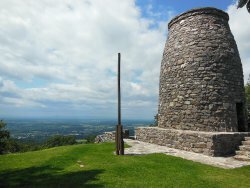 I'll be taking a plane to D.C., then bus, metro, and train to Harper's Ferry, WV where I'll find the Appalachian Trail. The trail runs from Springer Mountain in Georgia to Mt. Katahdin in Maine which is about 2180 miles, but I'm only doing the northern 1165 miles this summer/fall - that's why I'm calling this my "Half Hike". Other commitments both in the earlier summer and in October have allowed me only 55 days to hike so this is how far I figured out I can go - at a pretty brisk pace. Who will I most likely find on the trail? Well, those that are slow, injured, or got a late start. Possibly people not having a really good time. But, they've all made it over 1000 miles, so I plan to be as encouraging as I can, and learn as much from them as I can quickly. I've made it possible to read comments you leave here on my cellphone and reply to them - assuming I have coverage out there. Just a 'howdy' can be a real boost when I've been plodding down the trail for days on end, so I look forward to hearing from you. Also, I would appreciate it if you could tell any hiker friends you might have about my hike so they can follow along. 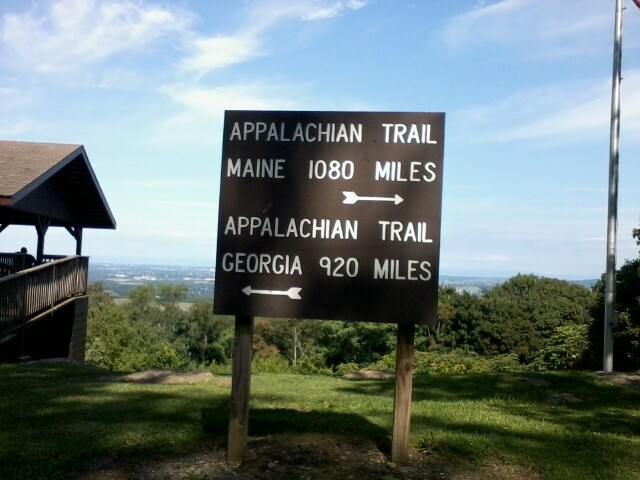 Finally, anyone living anywhere near the Appalachian Trail is welcome to contact me and hike along. An unexpected night off the trail at someone's house has always been a great surprise! Up at 3:45am and on a 5:00am flight to Dulles in D.C. From the airport, I caught a bus to the nearest Metro station. A metro ride, switching two trains to Union Station where I got a ticket for the commuter train. The train took me almost to my destination, but I required one more move to a bus for the last few miles to Harper's Ferry. I really can't imagine doing this sort of commute every day! I actually stepped on the Appalachian Trail today - but just stepping over it while walking from the train station to the Teahorse Hostel in Harper's Ferry. My entire day was spent on planes, trains, automobiles, and buses. So, I'm here and ready to start tomorrow morning. 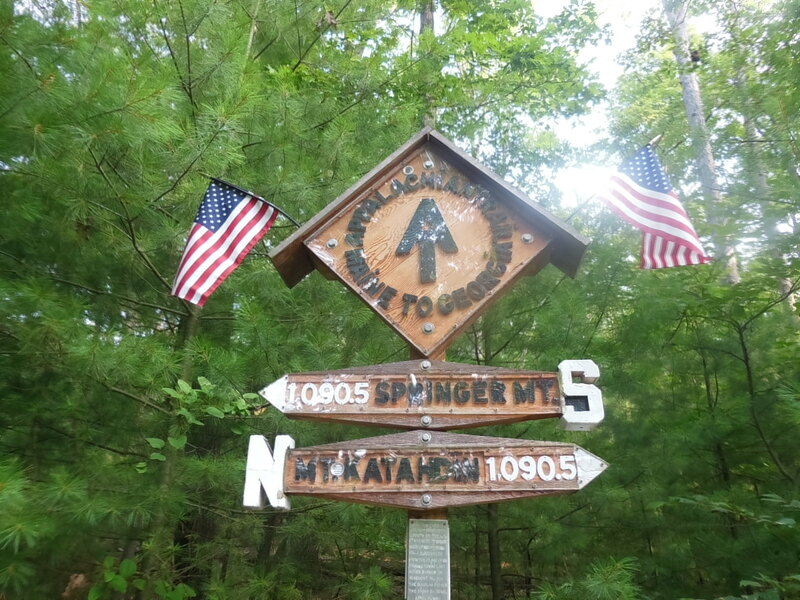 I met one other hiker at the hostel tonight, named Calamity Jane, but she's just starting her southbound hike tomorrow after having hiked north to Katahdin earlier in the year. The rest here are a bunch of bicyclists - they're ordering pizza for their dinner just now and it's amost 9pm. Looks like a late evening. The hostel, and its owner Laurel, are very nice. The town is very 'civil war' like - cannons, barricades, and such all over. Very cool. Well, we'll see what tomorrow brings! My first day on the Appalachian Trail has been spectacular! The Appalachian Trail Conservancy headquarters is in Harper's Ferry, and I though I'd stop there before starting off. Unfortunately, getting up before 6:00am, I walked past their place around 6:30 and they don't open until 9:00. Well, maybe when I start here to do the southern half, I'll stop in. I enjoyed a quiet walk for the 2 miles through town, finally searching for the first white blaze of the Appalachian Trail. I found it on a lampost and then found another by a train bridge - I was on my way! 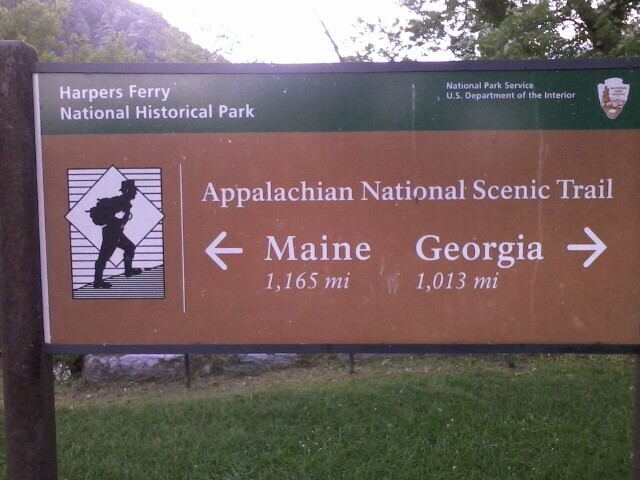 This sign started my journey on the trail in Harper's Ferry, letting me know I had quite a way to go in the next 55 days. My plan is to hike some long days at the beginning on what appears to be less mountainous parts of the trail so I'm ahead of schedule when I reach the more wild portions up north. The first few miles were flat along the old C & O canal that runs beside the Potomac River. So, it was a fast, easy pace. 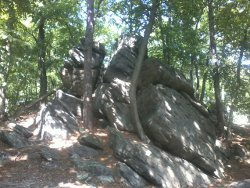 This was followed by a climb of a couple hundred feet up the Wetherton Cliffs to a ridgeline along which the trail ran for a few miles to Crampton Gap. Crampton Gap is the first of many, many battlefield memorials along the trail. The next one was Fox Gap, followed by Turner's Gap, followed by, ... and on and on. I quickly learned that most of the trail follows the forested ridgeline running northeasterly, with low valleys off to the east and west. It is fairly flat trail on the ridge, even though it is quite rough trail. But, a 'Gap' is a low point in the ridge, so that means a drop and subsequent rise in elevation with the more strenuous hiking that involves. The same is true for any shelter along the trail that has any sort of spur trail to it - you have to drop down to the shelter and back up in the morning. Being fresh and feeling great, I took a little side-trek up to the Washington Monument which had a wonderful, fresh breeze and views far to the west. I expect there are dozens and dozens of Washington monuments, but this one was pretty nice. There was even a little apple tree growing near it. I continued hiking along the ridgeline into the late afternoon, meeting quite a few day hikers and a few with packs, but none going very far. Water this first day was easy, having easy access to spigots at state parks, monuments, and that sort of thing. 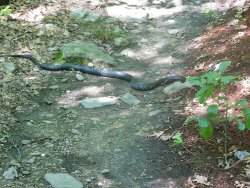 Late in the afternoon, I caught up to another fellow hiking north, named Rising Star. 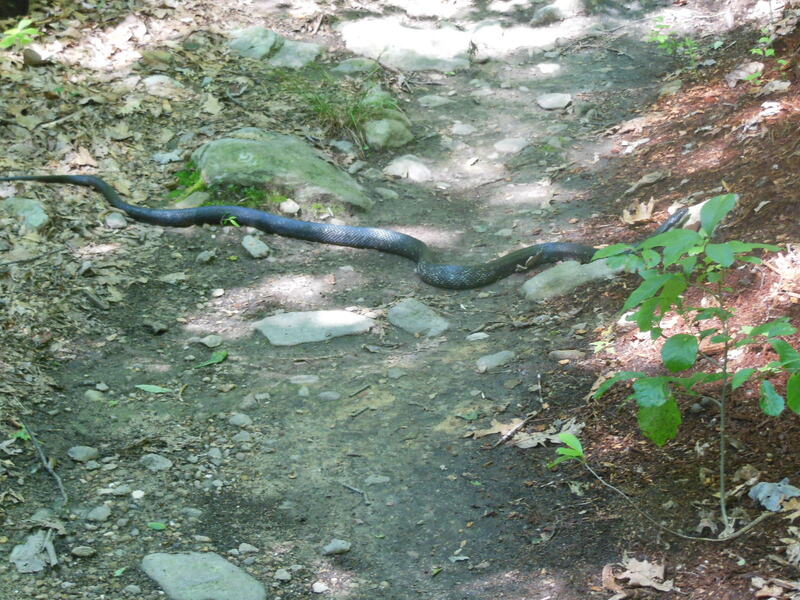 I chatted with him and we hiked together through the rest of the day. He is very knowledgeable about this part of the trail and showed me a terrific view from some hidden rocks, a spring with fresh, cold water, and a few other treats of the trail. I even got to help him when we came to a huge blowdown across the trail and he needed help with his (quite large) pack. Rising Star is heading to New York. I've already met more hikers than on my entire AZ Trail hike. I met one guy that has been hiking the whole trail from Georgia and is now following behind me. The katydids are amazingly loud tonight as the sun has set and things cool down. So, I hiked about 32 miles today, taking 68165 steps. It didn't seem nearly that long of a day, and I feel great. After a nice rest in my first A.T. shelter last night, I bid Rising Star farewell as he was taking a leasurely breakfast. I'm not doing any cooking on this hike, saving the weight, time, and cleaning of that chore. So, I got a bit of a late start but still covered a lot of very rocky miles. I crossed the Pennsylvania state line, completing all of Maryland! As soon as I hit Pennsylvania, I detoured west off the trail to get food at Walmart in Waynesboro. I had planned this so I would not have to carry much food on the plane and for the first two days. As it turns out, Walmart is a great place to resupply - lots of selection and inexpensive. Learned another important lesson - since the trail is on a ridge, all detours to towns involve another big down and up. And, the roads here are just as steep as the trail. 85 miles done, and only a few more to go! Not really, I think this just shows distance to the near borders of those two states, or it's just a very rough estimate. This is a sign in PenMar park, on the Pennsylvania/Maryland border. I had a big Subway sandwich for lunch and bought a salad at Walmart in Waynesboro after getting my food for the next 4 days. I was too full, so I carried the salad with me and ate it back on the trail. That worked out well, but now I have the extra trash to carry a couple days. I met a handful of SoBos (SouthBounders) on the trail, most at the end of the day. They were all going to wind up at a shelter I had just passed. Tonight, there's no one at the Rocky Mt. Shelter with me except some extremely loud insects out in the woods. I though they were cicadas, but I've since been told that cicadas are out in the day and these are katydids out at night. So, it's to bed by 8:30 and hopefully an early, healthy start tomorrow - but my left knee has started to ache on the steep downhills this afternoon. Other than that, everything is going well. I hiked about 25 miles today, taking 62232 steps. Wonderful, but challenging, day of hiking! My left knee throbbed all day, especially on downhills, so I did a shorter day. On the trail, I met 'Toots' and his sister. 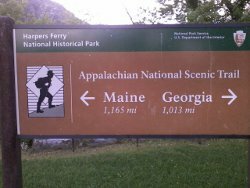 Toots is doing the whole trail from Georgia to Maine - he's a NoBo (NorthBounder). His sis is with him for a week or so. Played leapfrog with them a couple more times and we're staying at the same shelter tonight. When I reached the shelter, it has a nice, open field, a couple picnic tables, and a stream - very cool. Standing there in the sun is a young lady, just soaking up the warmth. I found out she is 'Wildfire' and has started in Georgia and hoping to reach Katahdin. We chatted awhile since I arrived around 4:30 and had time to relax. It was great to reach camp early, wash a little, and get to visit instead of just crashing in bed. A southbounder arrived and visited. Then, Toots and his sis finally made it just at dusk. It's sure wonderful to have people to talk with, but weird laying right beside complete strangers all night. I hiked about 20 miles today, taking 45602 steps. Wildfire's sister is meeting her this morning to hike a couple days. Toots and his sister are getting a late start and taking a short day since she'll be leaving the trail tomorrow. So, I'm up and out on my own again. The talk was that they might make it to a shelter 19 miles down the trail - that's where I'm heading since it's either that or one that is only 13 miles away. Soon after leaving the shelter, I passed this huge Half-Way marker. It would have been fun to be there when Toots and Wildfire passed it, but since I just started, it's not too meaningful to me. Coming out of the forest onto a paved road, I took my first (and only on this short trek) mis-turn. Actually, I didn't turn when I should have. Straight across from me, the wide trail obviously continued and I saw no blazes that said to turn. Usually, if the trail turns to the right, there will be a double-blaze with the upper mark to the right of the lower mark. Turning to the left is just the opposite. I saw none here, so I kept hiking ahead. After about 30 yards, I noticed the trail had more green grass growing in it than earlier. With 1,000 people just having trod it over the past couple months, I started getting suspicious. Another 30 or 40 yards with no blazes and continued fresh grass, I turned around. Investigating more thoroughly at the road, I noticed a white blaze on a tree about 20 yards to my left. Lesson learned (yet again) - always thoroughly check for trail markings at all intersections! At Pine Grove Furnace state park, a small store has a famous "half gallon challenge" where thru-hikers see how long it takes to down a half-gallon of ice cream. I arrived before 9:00am so I had a Honey Bun and juice instead. I have plenty of food and am having enough problems with my knee. It continues to throb and now hurts uphill, level, or downhill. I'm giving my knee tomorrow and then the next morning into Duncannon to get better, or I see a local doc for advice. Just to prove that the Appalachian Trail is rocky, it goes through this hundred yards of ridge called the "Rock Maze". White arrows are drawn up, down, around, and through the rocks and hikers are supposed to follow them. It's a fun little excursion, if you're in the mood for it. On this sunny, warm day, it was fun. I made it to the Alec Kennedy shelter with quite a bit of daylight left. I had high hopes that Wildfire and/or Toots would make it here, but no such luck. But, Connor from Colorado showed up and he's a SoBo having completed the northern half of the A.T. already. He was in Duncannon last night and had a long day to this point. Really nice guy. Just at dusk, another SoBo appeared - Gilligan - looking much like you'd expect a thru-hiker to look. Scraggly beard, filthy shirt, and unkempt hair. :-) These two are a real testament to the variety of people, styles, and goals out here on the trail. It sounds like they are at the front of the SoBo bubble so I should be seeing more each day, as long as the knee holds out. Unfortunately, today's short hike was no less painful than the past two. I hiked about 19 miles today, taking 46149 steps. I've decided to see a doctor in Duncannon. That's 30 miles away so I'll either get there tonight or tomorrow morning. 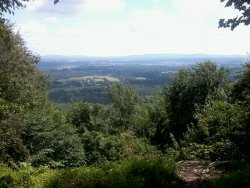 Fortunately a big chunk of today's hike is across the Cumberland Valley, roads, paths, and not rocky ridgelines. Leaving the shelter, I hiked over a mountain and down into Boiling Springs on the south side of the valley. While traversing clover fields, it started to rain so I made use of my trusty $2 disposable rain poncho - I've used it on three long hikes now and it's still good for a few more cloudbursts. Right in town, there were lots of fly fishermen were just pounding the water of a tiny stream that runs through it. I asked one what kind of trout they had and he grumpily let me know there were rainbow, brook, and brown. I walked on. I stopped at a gas station, hoping to avoid some rain, use the bathroom, and get something for breakfast. Two HoneyBuns for $1 was a cheap 600 calories, along with a chocolate milk, and I sat outside by a picnic table where some local men were passing the time. One saw what I had to eat and gave me a cantalope that he had grown in his garden. Mmmmmmm! While I was eating, the skies really opened up for 30 minutes or so, so I hung out under the eaves with the guys until most of it passed. Moving on from Boiling Springs, I'm pretty much used to my knee aching but across these flat, non-rocky paths, I make excellent time and the legs are working pretty well. At the north side of the valley, I stop for water and a rest at the Scott Farm Trail Work Center. From here, it's an 800 foot climb up another mountain to the next ridge. From my practice hiking at home, and so far on this trek, I've found I am able to plod along on uphills until I reach the top to keep up my momentum. I'm able to do this for up to 1,000 feet, but longer than that and I'm pretty sure I'll need a rest break. At the top of this climb, I was rewarded with this view back to the south across the Cumberland Valley to the distant mountain I had camped on last night. Down into another shallow valley across some fields and one more 500 foot climb to the final ridge walk of a few miles to the drop into Duncannon. This ridge was excessively rocky! I made my own name for it - "Pole Breaker Ridge". My trekking poles would often times slip between rocks and yank my wrists, feeling like they should be snapping. The rocks were tough on my knee and helped me make the decision to force my way ahead the extra 5 miles to Duncannon tonight instead of staying at the last shelter. 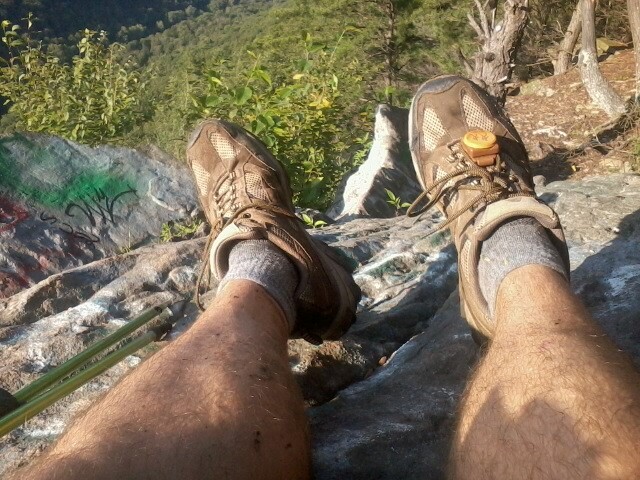 Before the final extremely steep and rocky drop into Duncannon, I rested by Hawk Rock. I knew it would take quite a bit of time to hobble down, but I had made good time across the valley and I should be in town by 7:30pm. You can see in the pic that this rock is a graffitti spot for the locals. You can also see my GeoPalz pedometer that I've used to monitor my steps each day, as well as my abused trekking poles - one has the tip completely worn away and the other has a screw in the end to extend it's life. 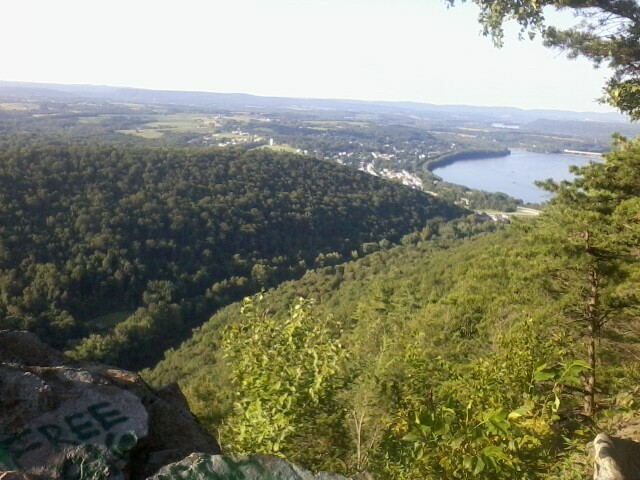 The 600 foot climb down to Duncannon was the steepest and rockiest of the trail so far. On top of that, I was out of water since the last I picked up was nearly 12 miles earlier. It was pretty grueling, but I found my way to "The Doyle" hotel around 7:15. The Doyle is an iconic Appalachian Trail stop. Some describe it as run-down, decrepit, trashed, disgusting. Others refer to it as rustic, antique, inexpensive, interesting. I'm in the latter group. The bar and entrance are the same - the bartender named John was very welcoming and friendly. I got a beer, then a room, and he told me there was a hiker-friendly pair of lady doctors just across the street. This was much better than the one I had found a couple miles away. It was fortunate that I had pushed the hike today because the bar/hotel closes at 8pm. After a shower, I got a big Italian Sub and soda down the street at pretty much the only place open this night. The rooms, and the entire hotel, are ancient and spartanly furnished. But, I had an old corner room with a cross breeze and a fan so I slept wonderfully with no complaints at all. And, the price was right at $25. I hiked about 30 miles today, taking 63558 steps. I'm still able to cover miles, but each step is just not fun. Here's the view into Duncannon from the last mountain I crossed yesterday. I was at the doctor's office at 8:15am and, since the 8:30 appointment didn't show up, I got right in. The doctor poked, prodded, twisted, and bent my knee and then decided it was sturdy and not too badly injured. I could keep hiking, but it would be better if I walked short miles and on level, smooth surfaces. I headed back to The Doyle to figure out what to do. After checking all my options, which took over an hour, I came to the conclusion that I could not summit Mt. Katahdin before October 10 if I took more than 3 days off. I also wouldn't make it if I did less than 20 miles per day. Finally, I would certainly not be enjoying any of the hike until my knee pain subsided since that is all I noticed every step and it would most likely take weeks to heal if I kept hiking. So, I packed my pack, went downstairs and across the road to the Duncannon train depot where I had seen a couple trains stop last night. I walked in and a young lady asked if she could help me. I said, "Yes, does the train stop here?" "Yes, it does stop sometimes." "I'd like to buy a train ticket." "Oh, the train stops occasionally, but this is no longer a passenger station. We are a real estate business and these are our offices." So, I waited outside The Doyle until the bar area opened at 11am. I used their slow but free computer to check airfares, trains, and buses for a way to get home. There are none of these services in Duncannon. I got the name of a local shuttler from the bartender/owner and arranged a $35 ride for the 17 miles to Harrisburg. I purchased a $216 Greyhound bus ride home to Minnesota from Harrisburg. Then, I waited the 5 hours until Mary would arrive and rescue me. It wasn't too bad. I nursed a beer all afternoon, deleted spam email, watched the bar TV, and chatted with the two hotel owners - real characters! In a nice way, I think. At 5pm, Mary picked me up and we had a nice chat in her old, rickity van. She has quite a story and is willing to share it if you ask. Certainly worth the price of the shuttle. I found "Lord of the Flies" in the snack shop in the Greyhound station, so I had something to read for the next 25 hours to home. While starting my book in the station, two police officers came in with 5 other people. They spoke with the ticket agent, said "Good Luck" to the five people, and left them. Hmmmm. At 7:45pm, it was time to load up, but those five people didn't board my bus. "I can smell it on your breath. Do you have any more with you?" "There's no drinking on my bus. If anyone drinks, I'll stop the bus and kick them off right then and there. Got it?" Welcome to Greyhound! I had 3 bus drivers - Harrisburg, Pittsburg, and Chicago. Each one gave the same lecture to all passengers about drinking, smoking, using the restroom, and getting dropped off the bus if there were any problems. Each one did it in their own, personal manner - one was awful curt, another made it humorous, and the last was just plain bored with it all. Fortunately, there were no problems like that on my ride. While on a Greyhound, I believe you are in a time warp - the hours just float by and you nod, doze, stare, read, fidget, and gaze. Not a lot of real sleep, but before you know it a couple hours have passed and it's time for a break - either transfer to a different bus, or food stop, or just a break for the smokers. It's amazing to watch the smokers on a bus. As we near a break, they fidget more, get antsy, and one even started cursing and complaining about everything. Unfortunately, he was right beside me for a few hundred miles and then a couple seats ahead of me for another few hundred. He was heading to Montana from Boston - poor guy. As soon as the bus stops, they fly out the door and a plume of smoke rises as they all puff away. I even saw one guy find a cigarette on the ground and use it - evidently from a previous passenger that couldn't finish it before his bus left. I did notice a very significant change on the bus in Milwaukee. A large number of people left and a more talkative, friendly group got on. They were not together, but were all headed to Minnesota. They chatted with their neighbors and seemed to enjoy the ride. Then again, they hadn't been on the bus for 18 hours already. :-) But, I think it was nice Minnesotans heading home. My Lord of the Flies book saved me. From Milwaukee to home, I figured I could read 10 pages per hour, so I spaced out my reading and made it last to the end. That was better than the monotonous staring out the window at a route I've seen dozens and dozens of times already. Then, just 1,106 miles and 25 hours from when it began, my Greyhound odyssey was over. I believe everyone should take a long distance bus ride at least every 30 years just so you can say you did it. So, where does this leave me? Well, my knee is ok, but still irritated. I'm walking on it and plan to do some short hikes this fall. 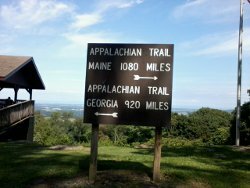 I am working on a schedule for next year to hike the Appalachian Trail, either from Duncannon north to Katahdin, or Harper's Ferry south to Springer. I'm going to schedule it shelter to shelter and ensure I have plenty of time to complete it, but it will be sometime around late July through October. If anyone is interested in a Half Hike of the A.T., please drop me a note and we can talk. @Cindy - By 'rest area', I hope you mean shelters. The shelters have a roof and three walls and a flat floor. There's (almost) always a water source around and the shelters get LOTS of use. There are over 200 shelters along the A.T. so, on average, you run into one about every 10 miles. But, sometimes they are 3 miles apart and other times 14 miles apart. There is a wonderful A.T. Guide created by a hiker name AWOL. Nearly everyone hiking long sections of the trail have it because it lists shelters, water sources, and other pertinent spots. I also tried out a phone app called Guthook's Trail Guide App and it was great! I don't rely on electronic items, but this app saved me A LOT of time and concern by confirming where I was, where the next water source could be found, and what the terrain ahead was like.